Is She Dreaming? Or Is She Dying? It’s been a pretty intense time on the El Cura ranch. The heat of August soared to 46 degrees centigrade (that’s 115 Fahrenheit to alla y’all), and while some of us were metaphysically dying in the heat, three of the sheep we are looking after on our house farm-sit literally died from it. The first one I found in the bunker underneath the alberca/swimming pool. It was dusk, and I had left Caveboy with my parents to take down to the Sufi watering hole for iftar (yes, there were actually people fasting from food and water in this heat). Usually I give the sheep food (hay or ‘forraje’, dried herby grass, plus oats and water) at sundown, and put them into their shed to keep them safe from wild dogs. But while counting them up, I kept trying to make them add up to eight, and getting confused at only finding seven. Cavegirl was meanwhile yawning and rubbing her eyes, hungry and dinnerless, but nevertheless determined to ‘help’ me. I was in a rush to get to the iftar meal, and ended up running up and down the hectare of land looking for the last lost lamb. Finding the prostrate woolly figure of the poor beast under the swimming pool sent me into a state of total panic. What the heck…?! My husband was away working at a festival in Portugal, I was on my own, my kids needed to eat…in a mad flap I ran about looking for the right course of action. OK, ring the sheep’s owners…and then what? The only sensible answer that came back was to go have something to eat and wait for morning. Dead sheep number one buried, I thought my turn as sheep-sitter was already looking pretty bad, when a few nights later, just as I had just got my kids to sleep, I heard a tremendous clattering and baaing going on in the barn. Still in my stripy PJs, with a pitifully small bicycle lamp in hand and a swell of trepidation in my chest, I crept out to see if someone was trying to steal the animals, or a dog was eating one of them alive. But the most peculiar thing confronted me. One of the lambs (a full-grown ewe, really) was lying on her side, running like a stabbed bull. Her hooves scraped the wooden sides in a hollow, futile gallop; her teeth were grinding, her head thrown back, eyes swivelling up in white-striped terror, foam frothing at the side of her mouth. Stunned, but strangely set into pragmatic mode, I went back to the house in search of Bach’s Rescue Remedy, the only thing I could think of that might calm her down as it has done a hundred times on my tantruming kids. It did the trick; the gallops started coming in waves, interspersed with peaceful lulls in which she panted in a a paralysed trance. I also did the other thing that comes to mind when trying to calm my kids down, which was to sing them the last few chapters of Qur’an in a lullaby voice. Slowly the gallops became less insistent, the pauses for breath a little more protracted. I started wondering what on earth was wrong with her; I was reminded of an experiment on cats I’d seen a film of in which scientists had removed the part of the brain responsible for paralysing the body during REM sleep. Sleeping cats were filmed acting out physically all of the actions it was obviously dreaming about – running, biting, hunting. The thought crossed my mind: Is she dreaming? Or is she dying? Despite the puny LED light shed by my torch, what struck me about the musty, dung-perfumed atmosphere of the scene was its primordial, almost Biblical nature. How many times must this have happened in the past, in exactly the same way? The other sheep were absolutely calm now that their shepherdess was there (oh, how naïve sheep are!) and carried on munching their hay blithely. Meanwhile, her legs became stiffer and stiffer – presumably the root of the Spanish expression for ‘kicking the bucket’, ‘estirar la pata’ (to stretch out one’s leg). Perhaps that’s where’ kicking the bucket’ comes from too. It was abundantly clear now that she was dying. A powerful peace descended on us, and I was overcome by the sensation of what people describe as an angelic presence, in that way that precedes the verbal formulation of it being angelic. In my tearful, sleep-deprived state I felt almost as though I was witnessing the birth of Jesus, in an anachronistic barn that had landed on the wrong continent in a malfunctioning time machine. I finally left her to her dying stupor, and somehow the peculiarity of the experience ebbed to the sort of stoical acceptance worthy of a weather-beaten peasant farmer, or even, perhaps, a sheep. The lamb had been born in that barn, so it seemed kind of sensical for her to die there too. Life and death are, after all, both threshold experiences, opposites ends of the roll of film but double-exposed, different panoramas both taken with the same lens. Now slightly inured to the visceral, animal vision of death – this time, according to the vet, it was caused by septicaemia – I was better prepared (though pretty dismayed) to see another lamb wobble dangerously on his feet as he came down to the barn a few evenings later, collapsing as he arrived. I had to grab him under the belly and hoist him into the shed to be able to close the door, but he stood there in a daze, not rooting around int he boxes of hay like they usually do. The kids were picked up by their dad at 10pm that night; I had to get him to heft all 50 kilos of the poor beast out of the shed onto the cool ground in the light of the car headlamps before they went (much appreciate it, ex-Caveman). I then put on my gingham lycra campesina superhero outfit and sprang into action, making phone calls and racing into town to find rehydration salts. En route I co-opted a few friends who gave me packs of salts and sugar, and another who obligingly came down with her son at 11 pm to help lift the lamb’s head up while I shoved a syringe of salty sugary liquids down its throat. Over a litre went down in 40 ml doses, sometimes trickling out straight away as he had lost the strength almost to swallow. His teeth chattered against the plastic of the syringe; a heavy fever had already set in. He lolled his head back, panting, dragging his legs back and forth across the grass, making straw angels in the dirt. At midnight we all withdrew. There was nothing else to do, short of sleeping on the manure-imbued earth beside the barn to keep watch over him, but I’m afraid I couldn’t muster up the saintliness for that. In the morning I went straight over to see if he was OK, but he was exactly where I’d left him, immobile, eyes dusty and frozen, his oily wool coated in icy dew. Dramas aplenty for one week, you might think. But no, this is the Alpujarras, land of pirates with green moustaches and hippies selling balls of enchanted mud in the market – anything that can go weird, will! So two days later, due to various bureacratic headaches, and probably a truck-driver who has just now decided to go on holiday, the carcass of Rambino number 3 is still lying under a plastic window blind on the edge of the land, rotting (I am waiting for the campsite next-door to start complaining of the stench). Yes folks, now is not a good time to come and visit Cavemum. And to top it all off, in the midst of that bubonic hum, together with my new friend Ricardo – a seriously cool old man from the mountains who doesn’t bat an eyelid at this sort of thing – I helped sheared the remaining five sheep this morning…with my kitchen scissors. Actually he used my kitchen scissors, I used my sewing scissors; I had to wash off the greenish lanolin with Ecover afterwards. Shearing a sheep by hand is quite an amusing experience. Pinning them down is one thing; one of the feisty mamas carried Ricardo halfway across the land while he clung onto its collar for dear life. Then we had to tie three of its legs (leaving one free so it can still breath alright), and get to work snipping away a two-inch deep layer of wool so dense and encrusted with mud and God knows what else that it seems we were chopping up a very unsavoury hippie’s foam mattress. Twice a sheep protested by spontaneously pooing all over the mounting heap of wool. It took an hour and a half, during which time we bantered about life and drugs and divorce and farming and Kenya and brain tumours and all sorts. Nothing like a tough physical job and a conversation with a weather-beaten man of the earth to set you right. After a vigorous cold shower (my gas bottle is empty), I left for the market feeling on top of the world,remembering why I was drawn to a life on the land in the first place. It’s real life, in all its shiny, delicious, stinky, hilarious glory. 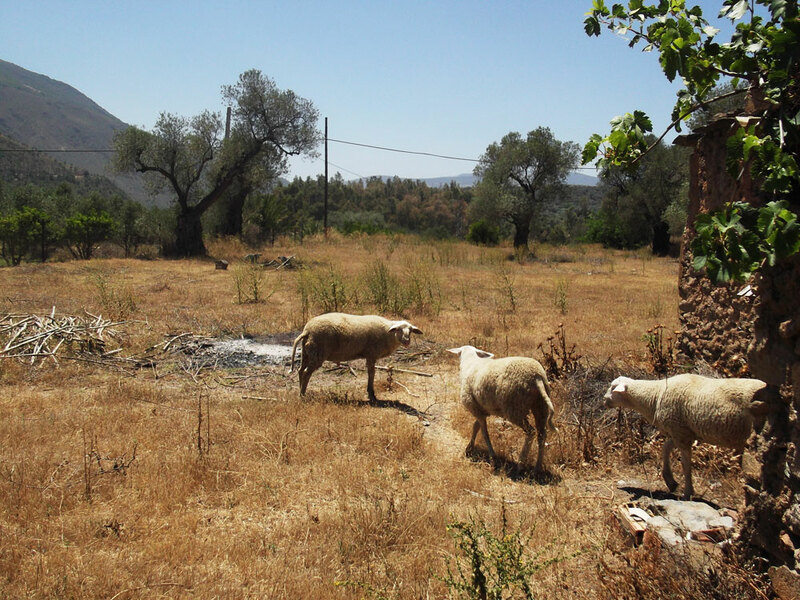 This entry was posted in Eco-farming, Funny, spain, Writing and tagged angels, animals, death, farming, humor, humour, life, spirituality, writing by cavemum. Bookmark the permalink. What a beautiful experience! Did it make death seem more of a liberation to you? In Islam there is a saying that when you sacrifice an animal it sees the gates of Paradise and starts running towards them. I suppose we’ll have to wait and see if it’s the same for us humans too =) Thanks for coming by and commenting. That is so sad, about the sheep. But encouraging that you push through it all. Yeah, it’s been pretty difficult watching them go. But it’s a good reminder that life is circular. There’s a new beginning in there somewhere. Thanks for stopping by! Haha! yes I was also not quite tuned into the stresses of a real life farm before…no more vision of little house on the prairie for me. But I still find it hard thinking about moving back to a town. I’m so glad you wrote this! Thankyou, I’m so glad you read it! Thankyou! I’m so glad you enjoyed it, I’m enjoying reading yours too! Where is this again? El Cura Ranch … where is that exactly? 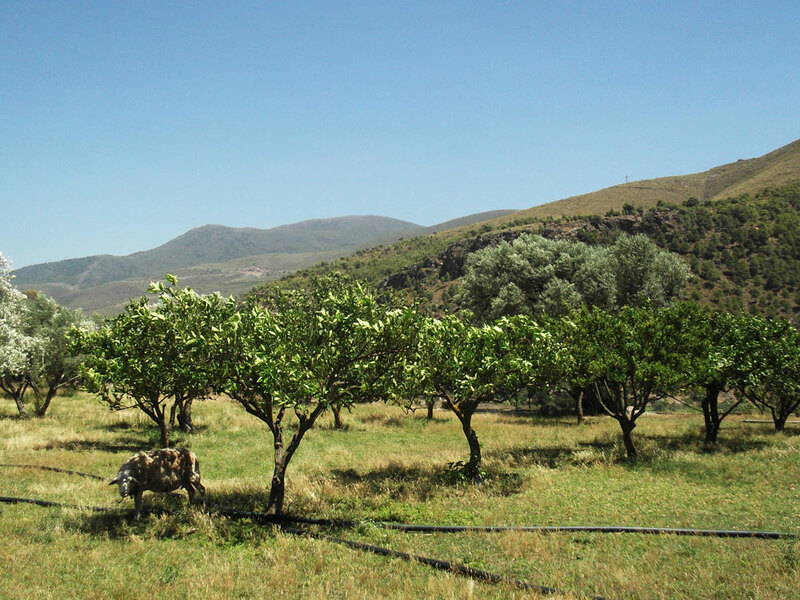 It’s in Spain, Andalusia, south of Granada, in the Alpujarra mountains. Thanks for stopping by and commenting! Yes it was seriously full-on! Everything seems so quiet now in comparison, haha…thanks for reading and commenting!